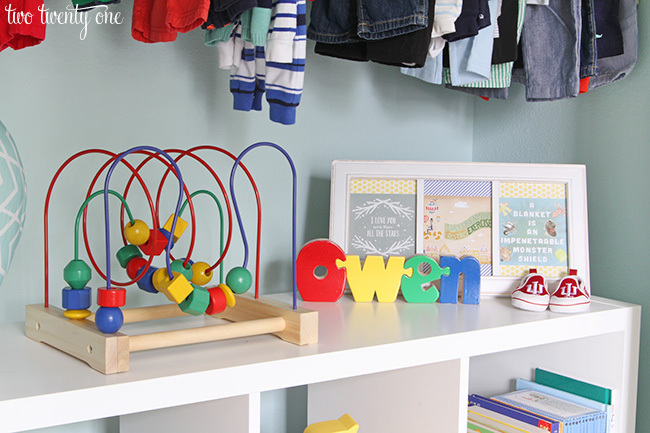 Last week I shared Owen’s nursery, so today I thought I’d share his nursery closet and how I organized it. It’s currently the most organized closet in our entire house so don’t think every closet in our house looks like this. 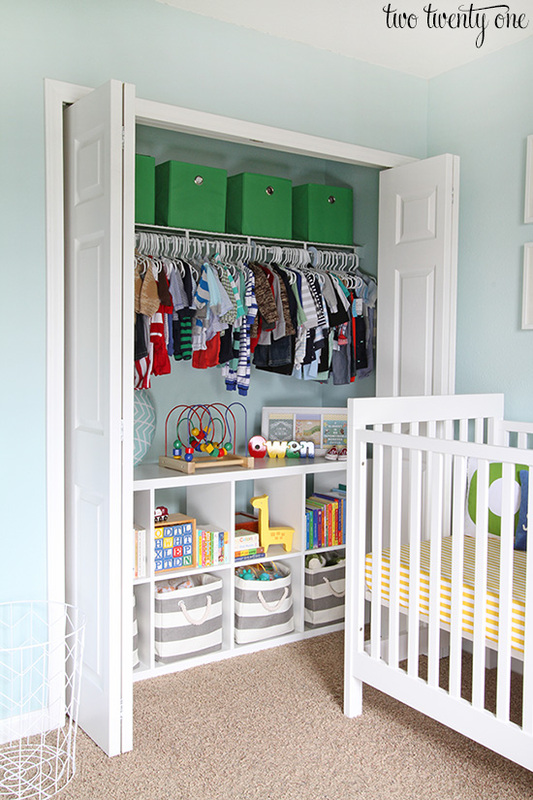 Our master bedroom closet is in shambles but Owen’s nursery closet is the epitome of organized. Such a spoiled baby. 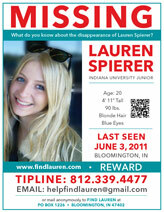 I’ve listed the sources at the bottom of this post. I knew from the beginning that I wanted to put an Ikea Kallax (formerly Expedit) four by two shelving unit in the nursery closet. We picked up the Kallax and Hemnes dresser on our Cinco de Mayo pilgrimage to Ikea earlier this year. I may or may not have bribed Brad with beer so he would take the 4 hour round trip with me. Like with the other nursery furniture, I measured and re-measured to make sure the Kallax would fit. And tadah! It fits with a couple inches on each side to spare. I love how the Kallax provides an ample amount of storage with the eight cubbies. And there’s still room on top since, you know, baby clothes are smaller than adult clothes and all. I used these bins in the four lower cubbies to hold various toys. When Owen gets older hopefully, HOPEFULLY this will help with getting out toys and putting them away where they belong. I put puzzles in the bin farthest to the left. He obviously won’t be doing 3D dinosaur puzzles for a while but they were too cute for me to pass up when I spotted them on sale at Zulily. Toys that he’ll be able to use very soon are in the second to the left bin. I got the giraffe piggy bank when I was in Greenville, SC back in March for a RYOBI Outdoor brand ambassador event. I had some time to kill so I explored the downtown area, which is so cute– Greenville is a beautiful little city with amazing food, btw. A locally owned stationary store was closing so everything was marked down. I snatched up the giraffe and a few more things. Bath toys and toys he’ll use when he’s older are in the third bin. And stuffed animals are stored in the last bin. 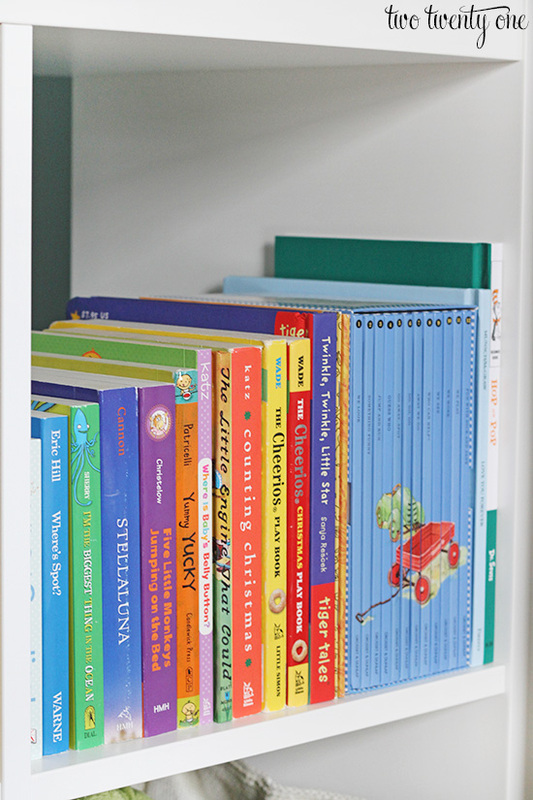 Since Owen has quite the book collection, there are books in every cubby of the top shelf. Interested in our favorite board books? See a list of them HERE! I couldn’t resist this IU train. 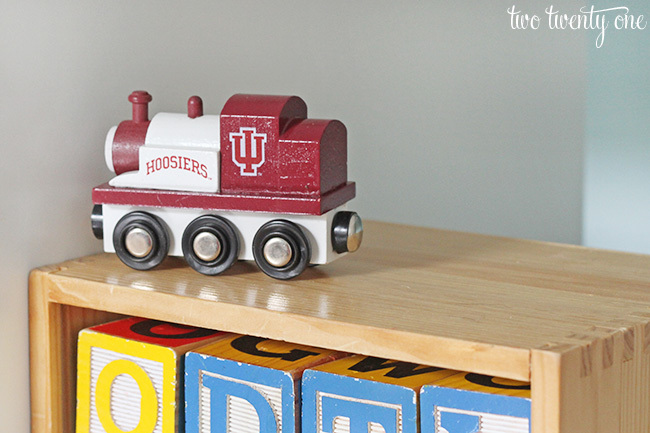 It was grotesquely expensive for such a small piece of carved wood with wheels and paint, but I guess that’s the price you pay for pint-sized licensed merchandise for your little Hoosier. For the two baby showers my best friend, Natalie, helped host, she had guests sign birthday cards for Owen until his 18th birthday. Cool idea, eh? At one shower I got his 18th birthday card. I proceeded to write, “I love you. Now get out of my house. Love, Mom”. I’m super sentimental like that. 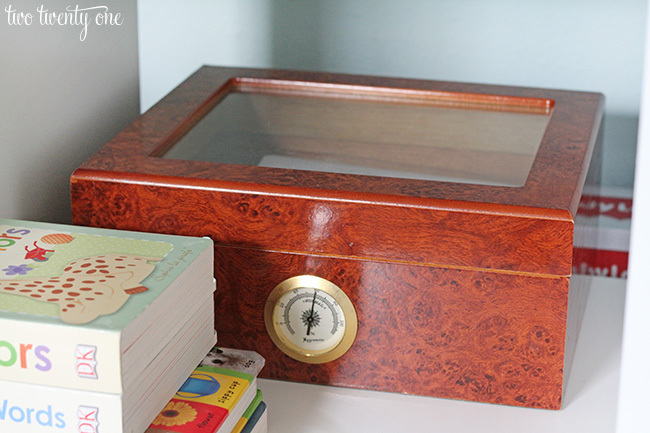 She found this vintage humidor at a thrift shop, and that’s where the cards are stored. I also picked up this Mula bead roller coaster during our Ikea pilgrimage. Natalie put together this framed art for Owen with illustrations from a calendar she had and scrapbook paper. 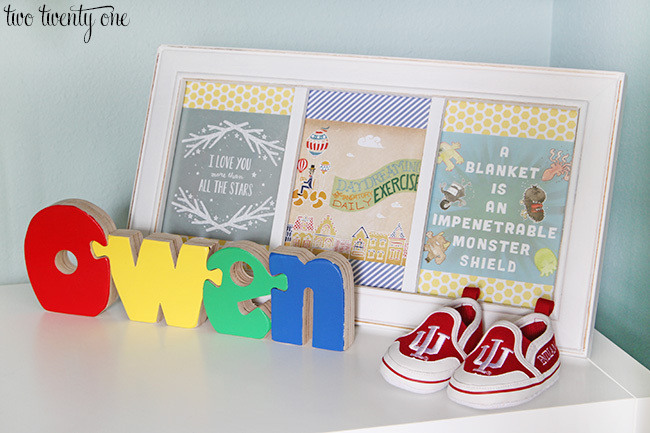 The Owen puzzle sign was another item I couldn’t resist from Zulily. And of course I had to buy Owen these IU crib shoes to go with his candy stripe overalls (see adorable photo here). Instead of buying separate pants hangers, I use clothespins to hang Owen’s pants on regular baby hangers. 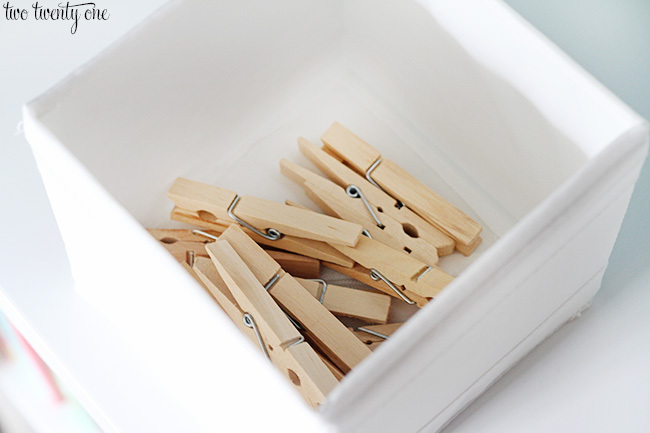 I keep the clothespins in a small drawer organizer, leftover from organizing Owen’s nursery dresser, on top of the shelving unit. 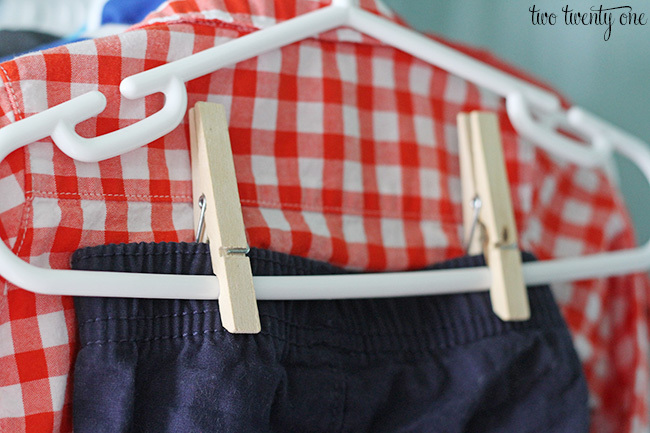 When I’m hanging up his coordinating outfits, or lone pants, I just clip them onto a regular hanger with the clothespins and hang the pants behind the shirts they go with. This child has more than enough clothes. 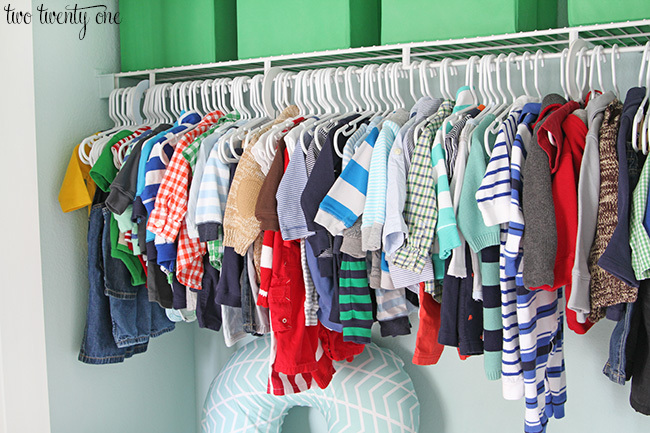 Seriously, what’s pictured below is only his 0-3 and 3-6 month clothes AND he has even more clothes in his dresser (I’ll show you that soon) AND in the green bins on the top shelf. I keep his clothes organized by size with the DIY closet organizers I made a couple months ago. Like I said above, I store some of Owen’s clothing in the 11″ x 11″ x 11″ green bins on the top shelf. You may recognize them from this post. I bought them for $3.50 from the clearance section in Target. Cha-ching. Alright, here’s where I got everything. I’m not going to cover everything little thing (i.e. all the toys and clothes) because that would take forever. So if you want to know about a specific item, comment and ask about it. And here is my trusty photo assistant. He wasn’t much help– mostly cooed to his Whoozit and kicked in his crib while I photographed the nursery closet. But he’s cute so I guess I’ll keep him around. 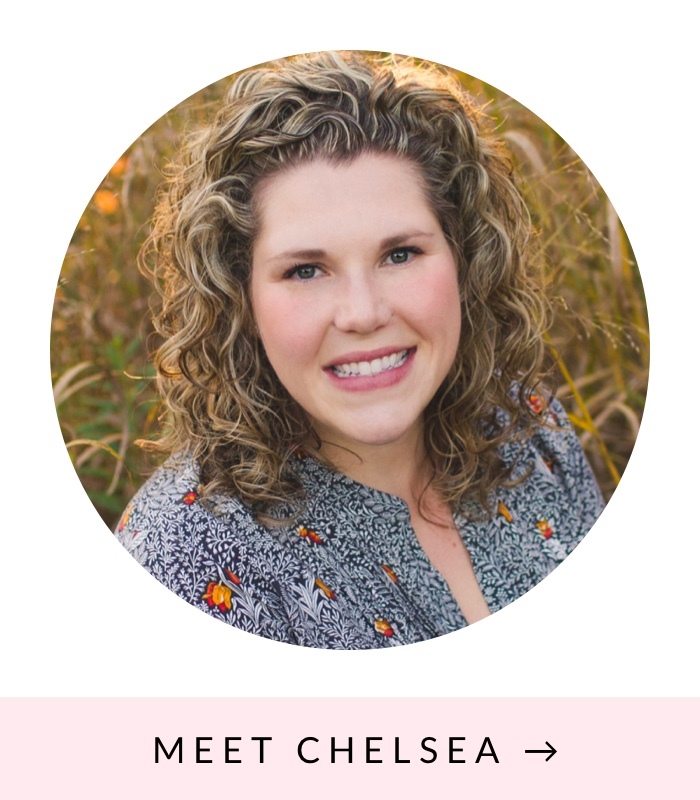 I recreated my baby registry HERE if you’d like to check it out! PLEASE anchor your furniture and electronics! A child dies every two weeks as a result of a tip-over incident. I strongly encourage you to read my blog post on how to anchor furniture and electronics HERE. Let’s keep our babies alive and well. 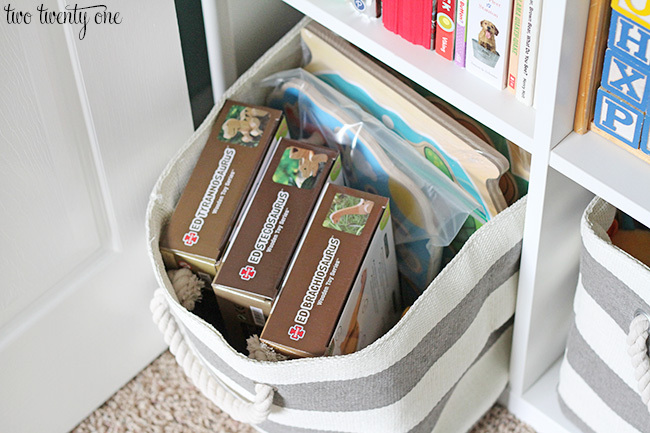 Want to see what the nursery closet looks like now that Owen is a toddler? Click here. Want to know something specific about the nursery (wall color, where I purchased something, etc.)? See the nursery source post here. Oh my goodness! My son needs a Notre Dame train just like that. That is adorable. Love his room! You did an amazing job. I’m impressed with your organization! What you’ve done with the Kallax is exactly what I’ve been picturing for our nursery, only it will be outside of the closet. I’m also thinking about purchasing the Hemnes dresser. Unfortunately, we do not have an Ikea close by (at least an 8-hour round trip! ), so I will have to order. Would you mind telling me if you purchased the dresser in the ‘white’ or ‘white stain’ finish, and if it matches the white on the Kallax? Online the ‘white’ looks more off-white, while the ‘white stain’ looks more true white, but I don’t want to rely on the pictures and be disappointed, especially since it would be difficult to return. I enjoy all of your posts, but I am really appreciating these nursery/baby gear posts because the timing is just so perfect for me! Thanks! The Hemnes is in white stain. Since the crib is pure white, I wanted the dresser to match as closely as possible, and the ‘white’ finish on Ikea furniture is too off-white. White stain is more of a pure white. I didn’t really care when it came to the Kallax coming in white since it’s in the closet. So if you’re looking for white-white definitely go for the white stain. I love how you put that shelf in the closet instead of out in the room! It looks so nice! I noticed the “Yummy Yucky” book among your collection. You will love it one day for all that your child learns from it. I sure do. Other book I like from the same author is Yes Yes No No. Hey, thanks so much for posting this. I have been planning to do this in our closet for our baby. Our closet it almost the same as yours so it’s great to see what it will look like when it’s done. Just wanted to check in with you now that you’ve had a chance to use it for a little while and see how you like the arrangement? Would you do anything differently? Do you feel there is enough storage space? Also wondering what your reason behind doing this rather than built in storage or vertical storage? Hi, Rebekah! So far so good. Granted we haven’t used the shelving unit much yet because my son is only 4 month old so he’s not getting into toys like an older baby. Right now I wouldn’t do anything differently. I think I took advantage of the space in the closet. The reason why I didn’t do built-in storage was because it wasn’t necessary. I would’ve either spent a lot of time doing it myself or paying a lot of money to have someone else do it. Not really worth it for me. I think I took advantage of the vertical storage so that wasn’t an issue for me. 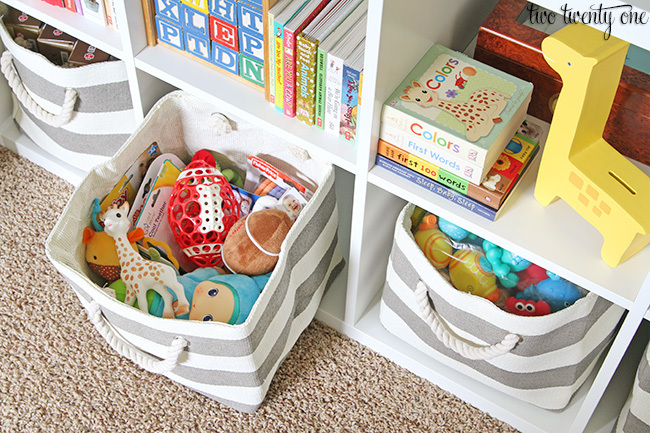 where did you get the storage basket in grey? I could not find it anywhere on your post where you bought it! I love it and would like to get one. i love this! Can you tell me where you got the train? I’ve GOT to have a UK one. We’re Kentuckian living in TX and we need this for our nursery! Hi, Julia! I got the train through Zulily. Hope that helps! 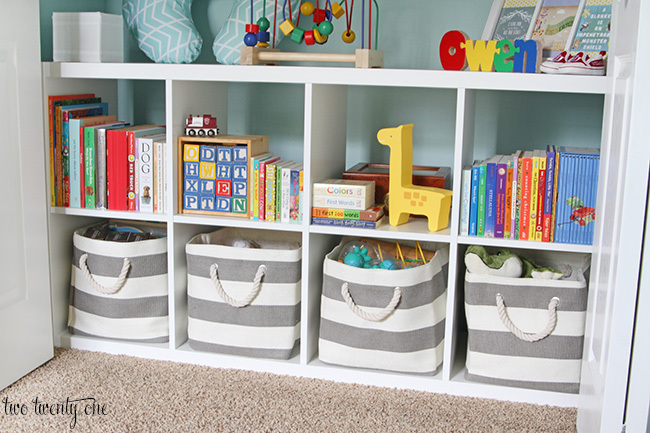 We are starting to think of ideas for our nursery and love the storage unit with the bins. Question – How big are each of the squares for the bins? I want to make sure that I get bins that will fit in those squares! Thanks! Went to Ikea yesterday bought the same exact shelf since I have the same closet as you at least it looks that way. The only way to get the shelf to fit in the closet was assembling it in the closet is this what you had to do? We assembled it outside of the closet and angled it to get it into place inside the closet. I think the clothing shelf wasn’t in place yet so we had room to adjust/maneuver the shelving unit in order to get it to fit in. If that makes sense. There’s about 2-3 inches on each side of the shelving unit inside the closet. Hope that helps! Hi! 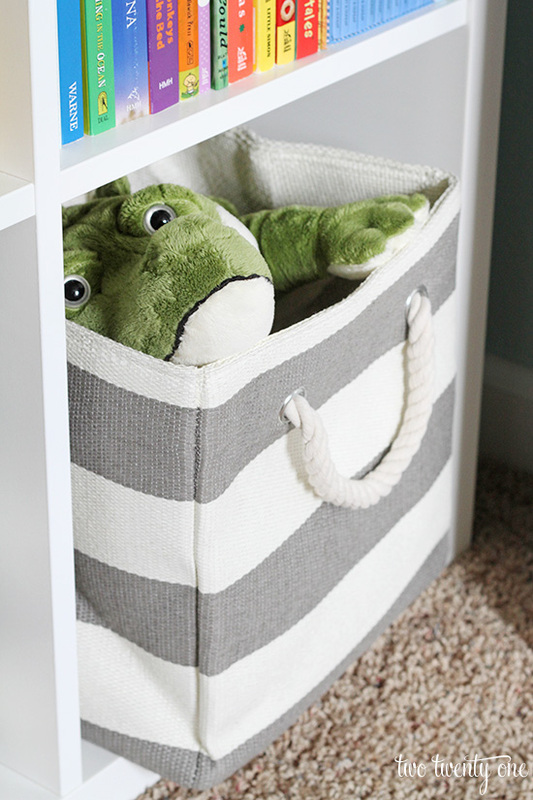 Did you get the Land of Nod canvas bins in the 11X11X11 size or the 16X16X16 size? Where do you put Owen’s shoes and socks? 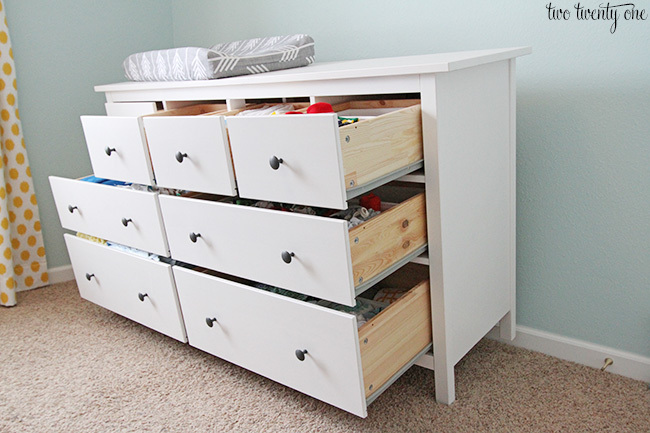 His socks are in his dresser (https://www.twotwentyone.net/2014/11/nursery-dresser-organization/). When I took these photos Owen was a newborn so he only had two pairs of shoes and I kept them on top of his dresser. I now keep his shoes in a container on top of the shelf in the closet. I am curious as to how high the clothes rod is hung and how much space is between the door opening and the shelf. I am wanting to have bins on top of the shelf that will sit over the rod, but I want to be sure that there’s enough room to get the bins up on the shelf in the space between the doorway opening and the shelf. Hope that makes sense! Thanks, Kendra! I think this is all dependent on the size of your closet. My closet probably isn’t the same size as yours so the measurements wouldn’t match up. If I were you, I’d measure the space and make a note so you buy bins that aren’t too big for the space. I just wanted to tell you that your idea for the cube storage unit in the closet saved me so much headache! We are having to double our nursery as a guest bedroom. I feel so much more organized and also I can use the top part of the unit for a changing pad if I want to. It looks so adorable! Unfortunately Ikea is 3+ hours away, but Walmart has the same unit for $68 plus free delivery! Just wanted to stop by and tell you how much I love the nursery! Thanks so much, Taylor! I’m glad my solution helped you with your nursery/guest bedroom! Hi Chelsea! I was wondering what size those green fabric cubes are? I am working on my little boy’s nursery (he is supposed to arrive November 15th) and love this post!! Thanks!! Hey, Jennifer! Congrats on your little man! 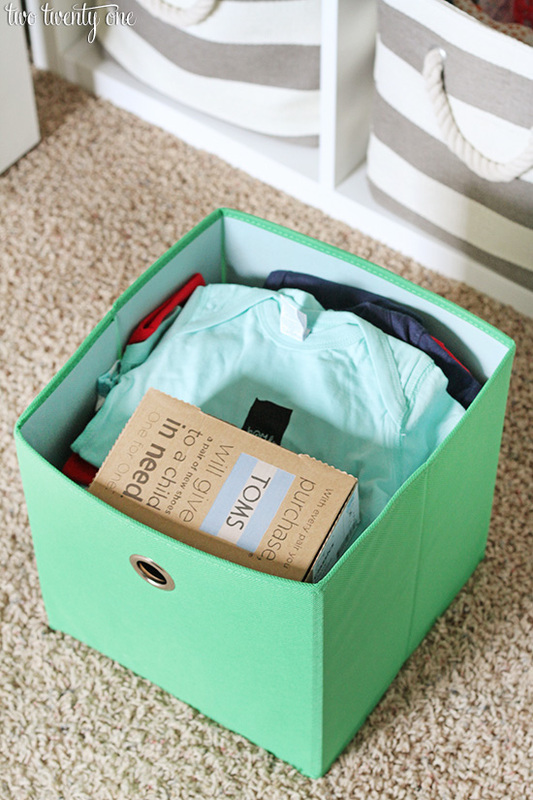 They’re 11″ H x 10.5″ W x 10.5″ L.
Love your closet organization. I was looking at the striped canvas storage and noticed you used 11x11x11. Is that big enough to store toys in? would the 16×16 fit as well? Just curious as to what to do for my kids playroom as options. 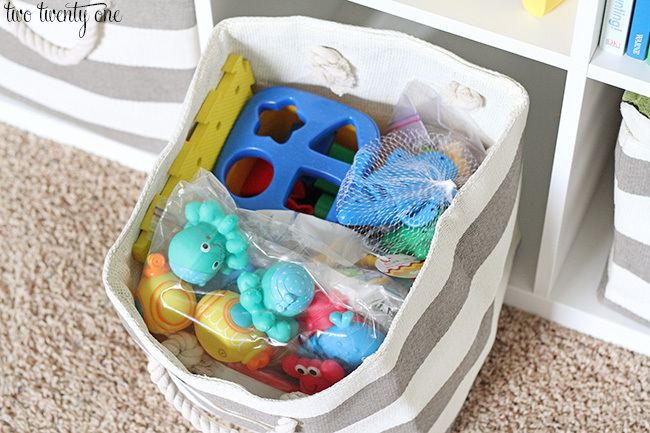 You can see in the photos what kind and how many toys fit in the 11″ bins, so yes, they’re big enough to store puzzles and other toys. 16″ bins would not fit in a shelving unit like the one I have. I measured my closet for the kallax bookshelf and also have an inch or two to spare but wondering how you got it in there? While the length of the closest is say 62 inches and the Kallax 59 inches, there are cloest doors that seem like I will not be able to just slide it in. Did you assemble it in the closet? Take the bi-fold doors off? Put in standing up then lay down horizontally? We assembled it outside of the closet, tipped it vertically, moved it into the closet and slowly turned it horizontally and lowered it into its place. I want to say I had the closet clothing shelf off when we did this. But that was easy to remove because it just pops off. I’m pretty sure the bins are the Room Essentials brand. Hi! Love this! I was wondering if the paint color in the closet is the same as the walls in the room? thx! Is it plain white or high-gloss white that you chose? 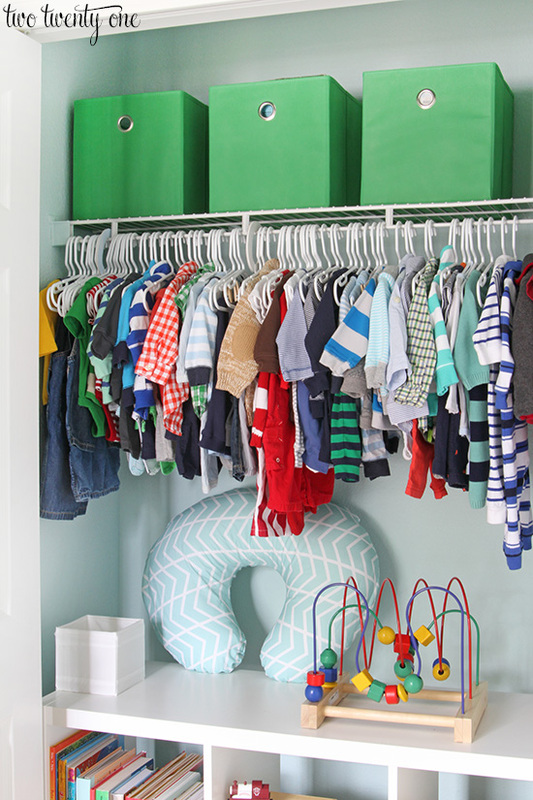 You did a great job on his closet and his nursery. He is adorable! I love his closet! So organized and colorful. Aww, such a cute little assistant. I was looking at the baby clothes and all these memories came flooding back of when mine were little (they are all grown now). Enjoy this special time. Your closet looks great! And it will never be better! Once Owen starts moving he will take over! Enjoy! Such a great re-use of the closet for amazing storage! And the bins are adorable!! What a super cute and organized closet! I love it! My daughter has a very similar closet and I’d love to put the shelving unit in hers. That would save me some sanity! Thanks for the inspiration! It looks amazing! Thank you for including the paint color – I was going to ask about it. It’s gorgeous!! I love the Kallax! We have two in my 5yo’s room and one in the playroom. 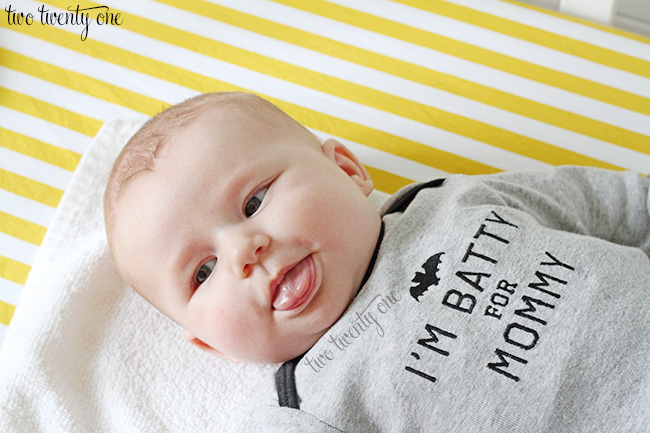 Now I want another for the baby’s closet!! What a great idea, totally pinning this. Thanks for sharing at Merry Monday! I love it! I used your closet for the inspiration in mine and linked you in a blog post I wrote about it (link below). You’re inspirational. I love love love this! Where is your crib from? Thanks! The Land of Nod. I have boxes of extra diapers…..where did you keep yours? With Owen being older now, how do you organize his shoes?! I haven’t come up with a clever solution yet! Love the nursery organization. I am sharing this on Pinterest. Love this! Out of curiosity what is the size of your closet and the actual opening when the doors are open. Trying to figure out how to make this work for us and I think that info would be helpful! Thank you!